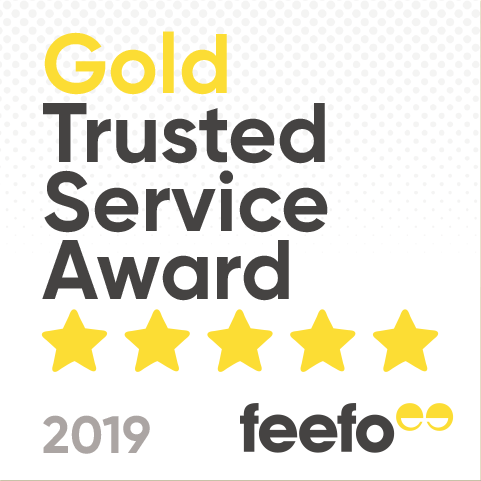 This review is based on my visit in March 2019 when I stayed for one week, but also draws on a previous visit in April 2017. The site is located north east of the city around three miles from the Minster. Firstly, as always, getting there. The approach is quite straightforward and should hold no fears for even novices – our Site Arrival video below shows the approach from the A64 which is the route recommended by the site – the turn off is about 18 miles from the junction with the A1, however the A1237 is fine too. 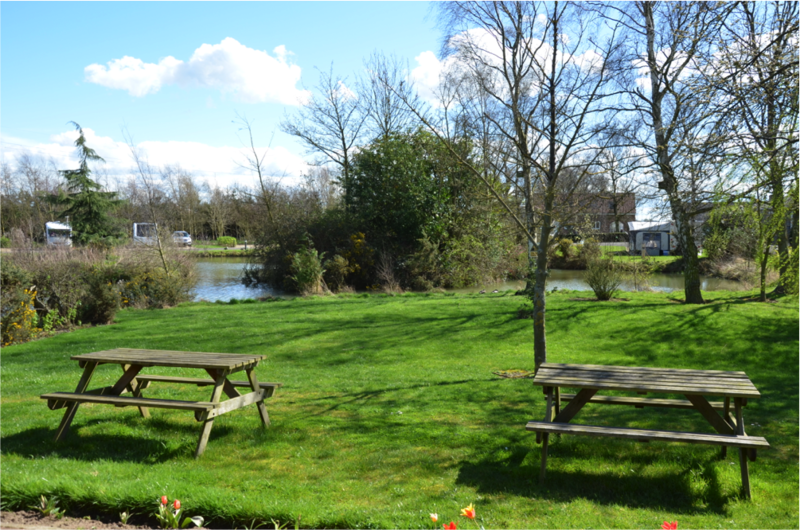 The site site is under the Tranquil Parks umbrella and so is adults only, generally opening from mid-March through to the beginning of January making it handy for a Christmas and/or New Year getaway. There are a total of 55 fully serviced pitches, the majority of which are hardstanding, however eight grass pitches are available, weather permitting. 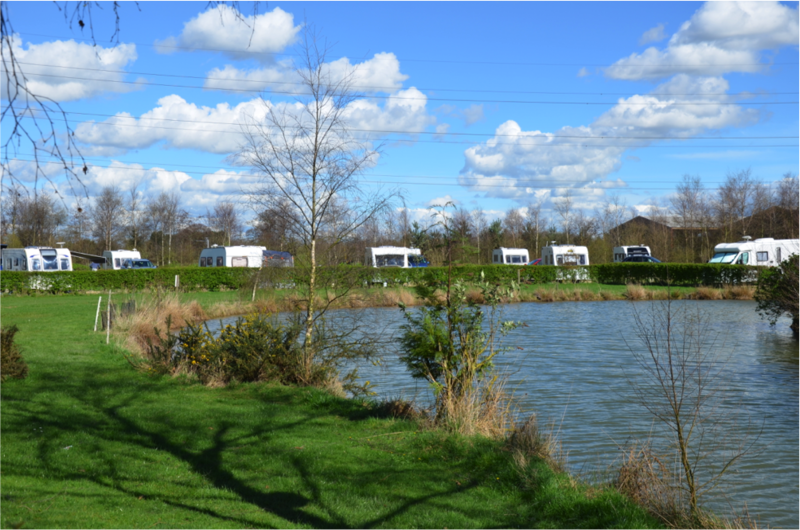 You’ll see from the Site Plan https://www.yorkcaravanpark.com/caravan-park-plan/) that a number of pitches border the little lake which, currently you can fish for free. You are more than welcome to pitch nose in to make the most of the view but bear in mind that then, the hook up bollard and waste point will be at the front of the pitch. You may need to consider the length of your water and waste hose if doing so. Access to the site is protected by a barrier, the fob for which you will need £10 cash as a deposit. The reception building is to your right by the barrier, with visitors car parking opposite. Further to the left are the rubbish and recycling bins, then to the right as you enter the pitching area is a motorhome service point. Arrivals are permitted from midday with departure by 11:30am although you can pay to arrive earlier and/or leave later if space is available. The facilities block sits just behind the lake and there’s some picnic benches there too. A feature of this site are the massive en-suite units consisting of toilet, wash basin and a very large shower – possibly the biggest I’ve seen on a site. Sometimes the hot water took a few minutes to come through but that maybe because I generally went for the same one that may have been the furthest from the boiler. When it did though it was plentiful and they really are the sort of showers you could spend quite a long time in. Also here is the laundry room – one washer, one washer/drier and one drier at the time of writing. Machines were coin operated and a wash cost three quid. There were also sinks and an ironing board and coin operated iron. In addition this served as the information room too with a variety of leaflets and menus and recommendations for pubs and takeaways. Around the back is the chemical toilet emptying point. As you will see from the site map, your four legged pals are accommodated with a dog exercise area to the rear of 31-35. For those that like to keep in touch with the outside world, free Wi-Fi is available but whilst all major mobile operators report a good signal, voice calls on my ‘3’ phone were a bit hit and miss indoors. Data was fine with the phone in the window though. I didn’t set up my TV here but Digital UK reports that you should be fine, however there are aerial hook-up points on the bollard. Right, getting out and about. York is the obvious draw here and rightly so, its a city I don’t think Ill ever tire of visiting. Getting there is easy – as mentioned its just under three miles to the Minster and within the walking capability of many. Another great feature of this site though is the bus stop that’s almost literally outside the site entrance. The Coastliner (http://www.yorkbus.co.uk/Coastliner.htm) buses ply their trade along this route and run every half an hour or so during the day. The journey west into york takes around twenty minutes and calls at the Railway Station – handy for the excellent and free National Railway Museum. (https://www.railwaymuseum.org.uk/) Have a look at our Slide Show (https://youtu.be/ycAVLDZxKQM) for a taster. If you stay on the bus it will pass through Tadcaster – home to the John Smiths and Samuel Smith breweries, along with one of the big international fizz merchants. The bus continues on to Leeds which is well worth a day out. I particularly enjoyed the Kirkgate Indoor Market, where you are perhaps more likely to find locals than tourists, and the old Corn Exchange. Some of the cross street Arcades are impressive too and there’s some great architecture to be found city wide. It’s about an hour to Leeds on the bus from the site, but if you fancy a change, you can jump on a train at York Station – trains are plentiful. Heading east from the site on the bus will take you to the coast, the interchange being at Malton. One service will continue on to Scarborough, however I was on the Whitby bus, stopping at the excellent Eden Camp museum (https://www.edencamp.co.uk/) – well worth a visit – and Pickering, where you could join the North Yorkshire Moors Railway (https://www.nymr.co.uk/), timetables permitting. The bus also calls in at Goathland – perhaps better known as Aidensfield in TV’s Heartbeat. It’s around two hours to Whitby from the site – and that’s a fair old time to be on a bus but I found them extremely comfortable. There’s on board Wi-Fi and USB charging points, but make sure you head to the top deck if you can and enjoy some of the stunning views of the moors on the way. Whilst in Whitby I would recommend a walk up the 199 steps to the Abbey – under the stewardship of English Heritage – and you could always reward yourself with a pint at the Whitby Brewery Tap. The courtyard is a lovely sun trap. 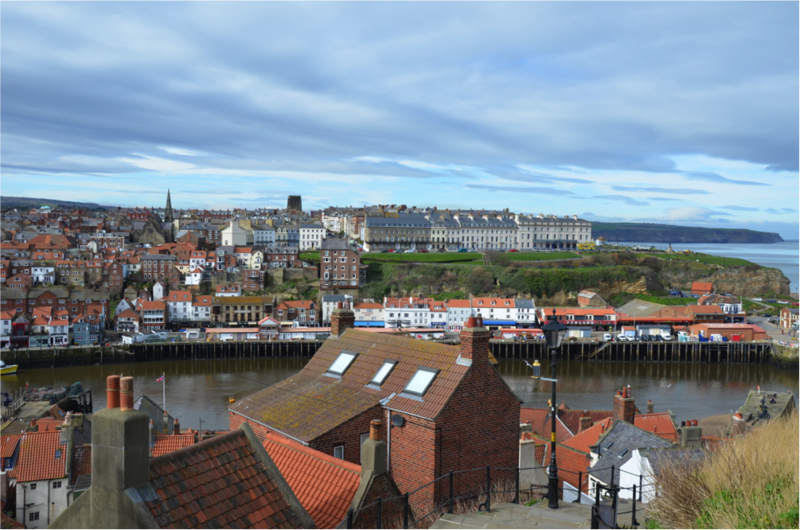 The views back over Whitby from the top of the steps are lovely too. It’s worth heading over to West Cliff to to see the Whalebone arch and the Captain Cook memorial as well as an another great view across the town. Fish and Chips whilst in Whitby is almost mandatory and there are plenty of options – and recommendations as to the best – but The Magpie Cafe option crops up as a favourite. Real Ale fans might want to head to the Little Angel on Wednesdays where you’ll find a wide range of ales on offer at just over three quid a pint. Back near the site, the Toby carvery is probably the nearest and you will have passed it on the way to the site. There’s more pubs too in nearby Heworth on the bus rout into the city. The Monks Cross retail park is around a five minute drive away for a bit of retail therapy but some of the major supermarket chains are here too along with filling stations to top up for your onward or homeward journey.